Louisville, KY USA: iKeyless launches the world’s first Universal Car Remote. The iKeyless Universal Car Remote works on millions of vehicles built between 1995 and 2015. This single remote replaces over 215 OEM keyless entry remotes. 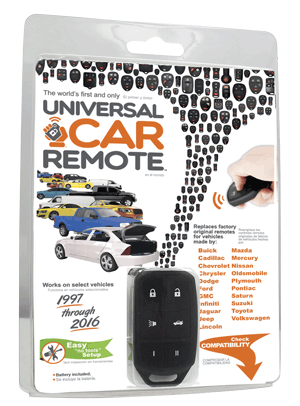 The Universal Car Remote has easy “no tools” setup, and is customer programmable for 100% of the vehicles it’s compatible with. A professional version is also available which covers 34% more vehicles. “Because we’re the world’s largest retailer of replacement keyless remotes, we’ve seen millions of remotes cross our path. We took the best of all those designs and created what has proven to be a superior product compared to OEM factory remotes.” said Mark Lanwehr, President, iKeyless LLC.